Nico working while I, obviously, am not. 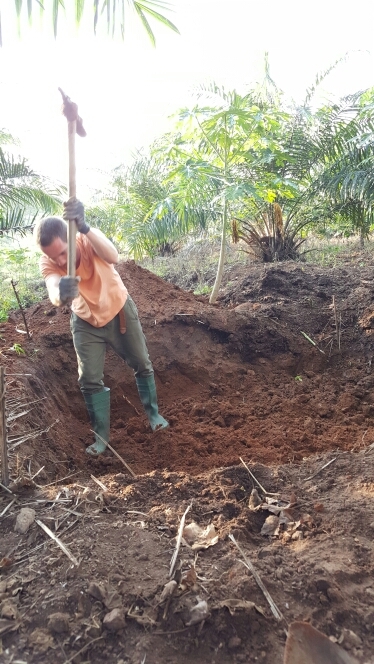 With only one week until Nico leaves, we realized that we need to kick our hole digging efforts into hyperdrive (we’re making a hole for the pig poop on the farm to be converted into fertilizer). Until now, we’ve been doing all hole-related activities in the afternoon and have been doing the normal farm work in the mornings. Today, we decided to work on the hole in the morning as well. I always feel like we’re making no progress because with the clayey dirt and the horrible shovels, nothing moves quickly. After breakfast, Nico and I went back to the EP computer lab to keep working on the computers. We’re up to a total of 5 of them that are mostly working now! By mostly working, I mean that they at least turn on, sometimes with error messages. It would be great if we could just wipe the computers and reinstall everything, but they obviously don’t have any of the installation disks to make that possible. Hopefully we can get a few more into at least usable condition. Also, disclaimer that I have almost no clue how to make any of these things, so take my descriptions for what they are (aka total guesses). Peanut soup – my favorite! There’s a piece of chicken, a rice ball, and peanut sauce. My favorite part is the rice ball because come on, how funny is that? It’s rice, squished into a ball! Genius! Like a snowball but even better. Waakye with cooked egg – hard boiled egg, rice mixed with beans, and a red sauce. Jollof rice with chicken – I know this looks similar to the fried rice, but it’s definitely different. I think that the rice has tomato paste or something mixed in because it’s stickier and redder than the fried rice. 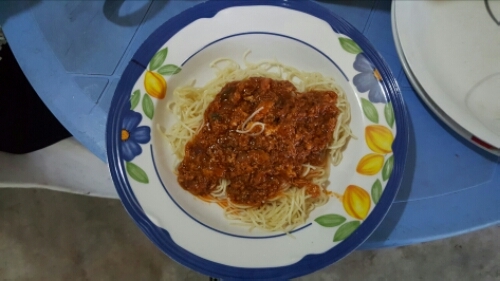 Spaghetti with egg sauce – pretty self explanatory… Angel hair spaghetti with a red sauce mixed with egg. Rice with vegetable sauce – don’t ask me what vegetables are in the sauce. I’m pretty sure that in normal life, I don’t eat most of them, but here I don’t ask questions. 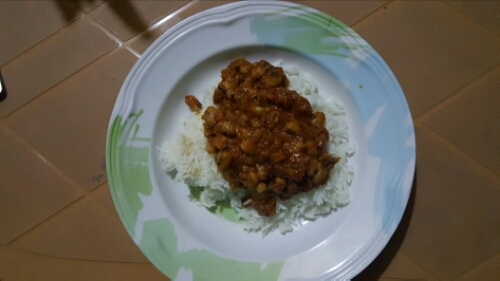 Rice with bean sauce – okay yeah, this looks identical to the last picture, but they really are two different dishes. This sauce just has beans in it rather than a mystery assortment of vegetables. You might be thinking that all of these things are really basically the exact same. My response to you is yes. Somehow I manage to fool myself into thinking they’re all such different meals, but it’s basically: rice with red sauce, spaghetti with red sauce, rice and beans with red sauce, rice with beans and red sauce, rice with a different sauce, rice with vegetable sauce, rice with vegetables mixed in. There are a couple things I don’t have pictures of, including ramen noodles (aka indomie) with vegetables and egg mixed in. So yeah, variety! But I’m not complaining, trust me. You’re looking at a girl who ate the same thing for lunch for two years. Carbs on carbs on carbs for every meal? This is like a dream come true! I Thought This Was the Dry Season?